Money back guarantee: Witouch Pro has a full 30 day money back satisfaction guarantee and a one year lifetime warranty. Summary: Witouch pro is the first wireless remote-controlled device using transcutaneous electrical nerve stimulation to provide back pain. Back pain is a serious condition that affects hundreds of millions of people all over the world. According to a study by the Mayo Clinic, approximately 80% of all U.S. citizens will experience persistant back pain at least once during their lifetime, while the NHS (National Health Service of UK) says that back pain is the largest cause of work-related absence in the United Kingdom. Other than surgery, some non-invasive methods for treating back pain include massage therapy, exercise, yoga, drugs etc. 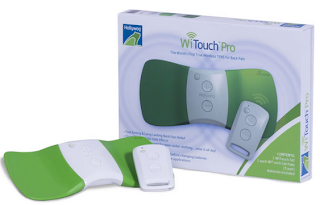 Today, we will present to you a product called Witouch Pro, an easy to use, effective device that you can use to get some immediate back pain relief. What is great about this product is that it i) uses transcutaneous electrical nerve stimulation which multiple clinical studies on humans have shown its effectiveness in treating low back pain, ii) is cleared by the FDA for over the counter use. Witouch Pro is a device that puts a fresh spin on an old tech, called transcutaneous electrical nerve stimulation (TENS) to relieve back pain. However, unlike its predecessors, it is the only device of its kind that uses wireless technology instead of wires, belts etc. WiTouch Pro has been developed by a team of innovative designers, engineers and scientists from Australia in collaboration with a research team in Tennessee, USA. Soon after its release, WiTouch Pro won multiple awards including the "Red Dot: Best of the Best” 2013 award and the award for "Best in Category, Medical & Scientific" at the 2013 Australian International Design Awards. How does Witouch Pro Work ? The way Witouch Pro function is simple and straightforward. The device uses TENS technology which suppreses the transmission of nerve pain and increases the production of endorphins, which in turn reduces your sensitivity to pain. Is Witouch Pro effective in relieving back pain? One of the greatest things about Witouch, is that the main technology behind it (TENS) has been studied extensively to humans, and has been actually used for back pain relief for more than 25 years. All the currently available clinical data clearly show that TENS technology can greatly reduce back pain, both acute and chronic. For instance, in 2007 Johnson & Martinson  published a meta-analysis of 39 randomised clinical studies examining the effectiveness of TENS in treating backpain. The meta-analysis concludes that: "highly significant reduction in pain with the use of TENS compared to placebo controls". Furthermore, another study by Fishbain et. al. on 376 patients with chronic back pain, found that TENS therapy greatly alleviated their pain levels. What do users say about Witouch Pro ? "I must say, I was a bit doubtful to how well it would work, however I am very pleased with the results I got. Witouch has been a great relief." 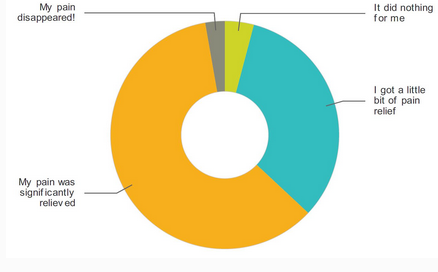 "My initial thoughts were that the device was a little pricey for me. Now I have been using it for a week or two I would have gladly payed twice the price." "I suffer from rheumatoid arthritis and fibromyalgia and frequently use a tens unit for pain relief. Although the tens helps relieve my pain naturally I have always hated using these devices because of all the wires involved. A real...pain! I have been wearing Witouch every day since I got it. The unit attaches to your back and is light and controlled by a small remote and is completely wireless. It is awesome!! I wear it constantly. Highly recommend!!" The Verdict - Is Witouch Pro worth buying?